Breitbart reported that four U.S. Senators addressed the media at the King David Hotel in Jerusalem Monday morning before the official US embassy relocation, along with ten Republican U.S. Congressman — but not one Democrat joined the U.S. delegation for the embassy event. 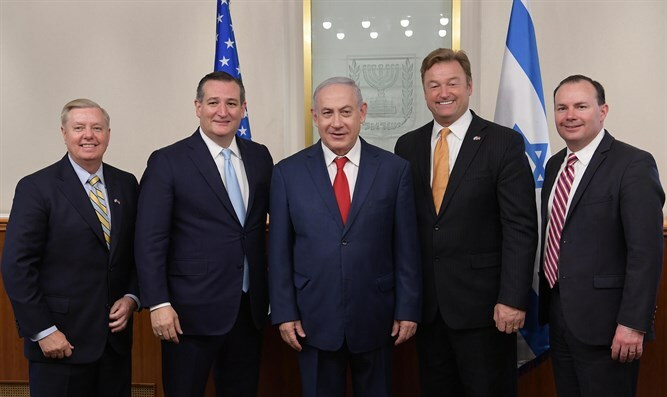 Senators Ted Cruz (R-TX), Dean Heller (R-NV), Lindsey Graham (R-SC), and Mike Lee (R-UT) , along with the ten Congressmen made the trip. US Senate Minority Leader Charles Schumer (D-NY) was however able to offer words of praise for President Donald Trump's moving the embassy. The closest thing to a prominent Democrat in attendance was former Sen. Joe Lieberman (Independent-CT), who was Democratic vice presidential nominee in 2000 before being rejected by his party in 2006 for his support of the Iraq War. Breitbart spoke with Sen. Graham who said that no one, Republican or Democrat, had been specifically invited to the ceremony, and that only Republicans had come of their own volition. Fatwa: Hunted in America author Pamela Geller tweeted "Not one Democrat in Jerusalem to honor U.S embassy move to Jerusalem: The Democrat party - the party of Jew hatred and jihad."